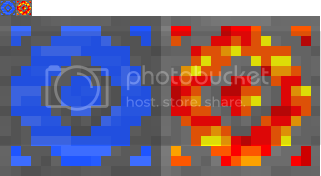 Adds an Instant Lake block that when placed entirely fills an area enclosed by blocks with water, and an Instant lavapool block that does the same thing, but with lava. Also adds a "Magic Bucket" that removes one entire layer of liquid blocks in a body of water or lava. Instant lake can be crafted in survival mode with 8 buckets of water around a diamond. If there are no blocks to bound the water within 100 squares of where the block is placed, it does not create water. Useful for creating lakes quickly for scenery, or turning holes caused by explosions into ponds. The index for the Instant Lake block is 450. Adds the Magic Bucket Item that does the opposite of the block. Can be crafted just like a normal bucket but with diamonds instead of iron. The Magic Bucket can only remove liquid not pick it up. Item Index: 452. Hopefully more updates and bug fixes coming soon. Find the InstantLakeSettings.txt file, it should be created in the .Minecraft folder the first time you play with this mod. For a server it will be created in the same folder as the server jar. To change the settings simply change the integers in front of each line as the instructions say, then save the file. If you are playing on a server you will not be able to craft items if your recipe for that item is set differently than the server's setting. Bounding, Crafting recipes and block IDs can be edited. simply place everything in the .zip folder into your mincraft.jar or minecraft_server.jar after you have installed minecraft forge. If you already installed the beta of this mod, no problem, just place the files in your minecraft.jar and replace the old files with the same name. Server is only for [1.3.2] at the moment. This mod based off of the I.L.B. does the same thing but instead of just water and lava it puts down a layer of solid blocks. Blocks included so far are sand, gravel, snow, dirt, stone, planks, glass and TNT. This can be useful for creating worlds or a "Spleef Zamboni" that could instantly repair a spleef field. The crafting recipes for these blocks are 8 of the blocks you want around a diamond. If you want to see this mod in action there are multiple mod review videos in the comments, go watch them! Copyright: Feel free to use any of the code, classes or textures from this mod in you own mods, or to modify my code in any way. You only need to give me credit if you share the changed files online. Cool video, thanks for making that! It doesnt create water if there isnt any kind of boundary to contain the water within 100 blocks of where you place it. It's intentional so if you misplace it you don't create a massive flood. The mod has been updated! I edited the first post with the new link, so get it there. Some advice for how to use this mod: If you want to fill a large area with water/lava, stack block up in the very center of the pit up to one block lower than where you want the water level to be, then place the Instant block on top of the stack. Using this method you can fill large areas with water very quickly. Great mod review, thanks for the support guys! I could do that. That will probably be in the next version of this mod. EDIT: Hurr durr, I was only going off the images in the banner, didn't take a good look at the ones in your hand mid-screenshot. So, feel free to ignore this. Ask me about giant, Canadian, zombie-steampunk tyrannosaurus rexes. I own one, and her name is Cuddlemuffins. I want to put a download link to these textures in the mod description. So if people want a different texture they can download yours. If you don't have one I can just put the textures in my own dropbox and post a link to it. I just added this to the Minecraft Wiki mods page, hope that's okay with you. Very useful! I preferred the old textures though.